As I explained in earlier posts, the cotillon may have been introduced to London in the mid-1760s by Giovanni-Andrea Gallini. His ‘collection of cotillons or French dances’ was probably first published in 1765. By 1768, the cotillon had become the first-ever dance craze. Newspaper advertisements during that year show that these contredanses françaises were central to the balls and assemblies organised by some of the biggest names in London entertainments for the beau monde. 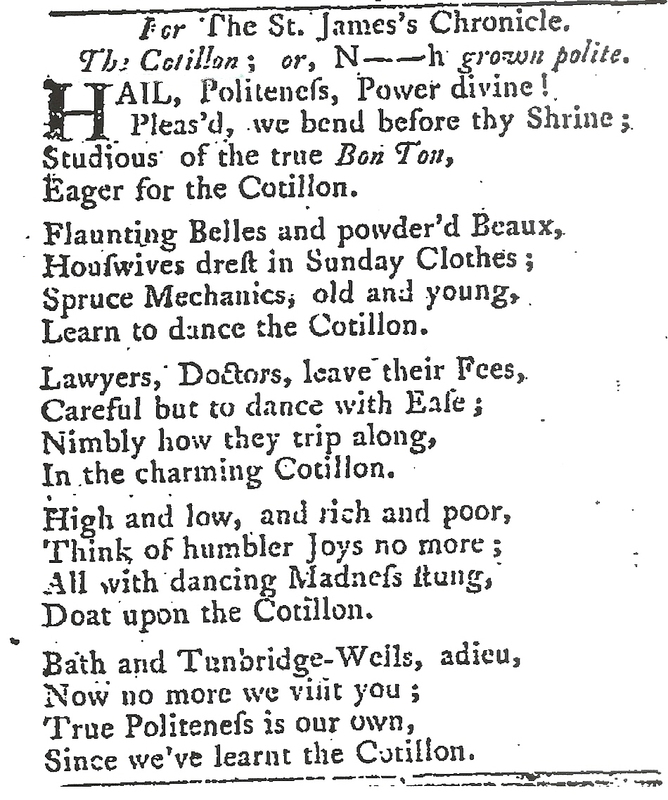 The St James’s Chronicle for 16-18 February 1768 included a poem satirising this ultra-fashionable dance. St James’s Chronicle or the British Evening Post, 16-18 February 1768, from ‘Poets Corner’. This was one of many such jibes – a sure indication of the dance’s overwhelming popularity. Tickets were half a guinea each (around 52 pence, equivalent to at least £55 today). Gallini had already held at least one ball that year. Although the advertisements for his ball on 23 March 1768, like those for previous years, made no specific mention of the cotillon, Gallini did promise ‘great Variety’ of dances. He may, of course, have been including cotillons in his balls even before the publication of his collection but only felt the need to advertise them when faced with competition. Over the next few years, the cotillon ball remained very popular. I will pursue this phenomenon a little further in a later post. This entry was posted in Ballroom Dancing, Country Dancing, The Cotillon and tagged Baroque Dance, Cotillion, Gallini on May 28, 2015 by moiragoff.